Autism is a developmental disability and a spectrum disorder which can affect a person from mild to severe and is characterized, in varying degrees, by difficulties in social interaction, verbal and nonverbal communication and repetitive behaviors. 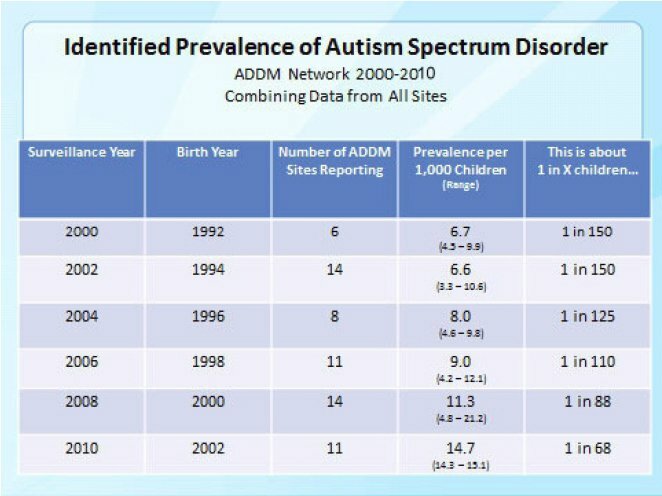 The CDC has found the prevalence of autism to be 1 in 68 children in 2010, with one fifth of those to be female. In 2004, the CDC found that the prevalence was 1 in 125 of those born in 1996. That cohort turned 18 in 2014. Autism is the fastest growing disability in the nation, with 1 in 68 children under 8 being diagnosed with this disability. Girls represent about 25% of those diagnosed with autism, and their unique needs are often overlooked. In Westchester County, New York, hundreds of teens who have autism and other developmental disabilities will be leaving the public school systems in the county in the next few years. Because of their access to academic and vocational programs and inclusion with their typical peers in school, these young adults, unlike the generation before them, have greater potential to participate in the mainstream workforce. It is a tragedy and a waste of human potential that 80% of adults with developmental disabilities are unemployed today. Many young adults with autism will need ongoing job coaching and supported employment opportunities. There are very few traditional employers who are willing to hire people with disabilities – especially until they can prove themselves to produce at the level of a “neuro-typical” employee. Given the lack of opportunities with established businesses, there is now a trend in parent-initiated social enterprises such as farms, software testing services, computer games development, cleaning services, laundry services and car washes. These business models take the approach of playing to the strengths of a person with autism, for example, attention to detail, committed to rules, ability to focus, interest in repetition, ability to find patterns, loyalty.